Deflation in generic drug prices dragged down second quarter earnings for drug wholesalers and generic manufacturers. Here’s a useful summary from The Wall Street Journal, which captures the grim marketplace realities in Falling U.S. Generic Drug Prices Hurt Manufacturers, Wholesalers. Yesterday, Mylan's earning release noted "high-single-digit erosion expected in North America." 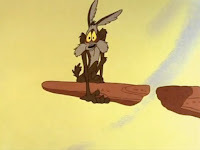 Below, I review the state of the generic drug market. 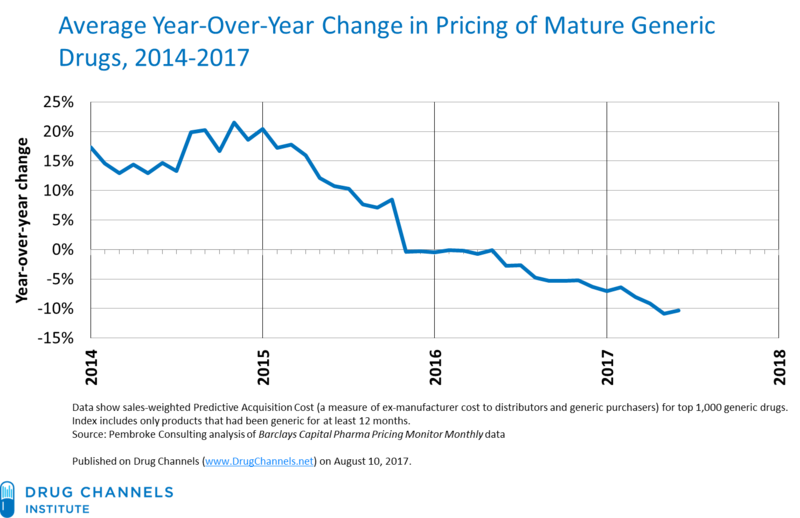 As you will see, the overall market for mature generic drugs is deflating by about 10% per year. Many generic drugs have dropped significantly in price over the past four years. Surprisingly, the prices for about one in five generic drugs remain elevated. Scott Gottlieb, M.D., the new head of the Food and Drug Administration (FDA), has prioritized actions that should squeeze the remaining generic inflation out of the system. I expect generic drug deflation to continue—and possibly accelerate—over the next 12 to 24 months. Payers and consumers will be the ultimate winners, but the drug channel faces significant disruption. In the meantime, let’s all hope that these price declines don’t trigger shortages if generic drug makers flee this sinking market. The unexpected generic drug inflation of 2013 and 2014 was generally good for pharmaceutical wholesalers. They benefited from generic price increases, which were typically passed on to their pharmacy customers. Barclays Capital estimated that from 2013 to 2015, the Big Three wholesalers—AmerisourceBergen, Cardinal Health, and McKesson—earned $1.6 billion in extra gross profits due to generic drug inflation. Those profits dropped to the wholesalers’ bottom lines. Multiple factors contributed to this period of inflation. Some companies exited the production of certain products; other manufacturers faced production problems; and an FDA backlog of applications for new generic drugs prevented new competitors from entering the market. The U.S. has also accused some companies and individuals of conspiring to inflate the price of certain generic drugs during this period. Generic inflation began easing in 2015. This was due partly to the FDA’s having cleared much of the backlog for new generic drug applications. The government’s 2016 fiscal year set a record for generic drug approvals. It looks like 2017 will have even more approvals, based on the latest FDA activity report. The chart below shows market-wide price changes for a sales-weighted index of mature generic drugs. 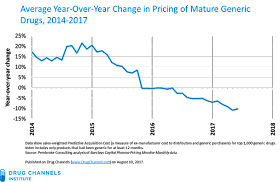 As you can see, generic drug prices declined an average of 10.3% in June 2017 compared with the prior year. Note that this index includes only products that had been generic for at least 12 months. This methodology eliminates the deflation that occurs when a brand-name drug loses exclusivity and faces generic competition. See Exhibit 138 in our 2017 Economic Report on U.S. Pharmacies and Pharmacy Benefit Managers. Good old-fashioned competition is also driving down generic drug prices. As generics come to dominate pharmacy dispensing, those pharmacies and wholesalers with below-average acquisition costs will be the best positioned to succeed. In response, the largest wholesalers and drugstore chains have entered into combinations that aggregate generic purchasing power. In May 2017, Express Scripts’ Econdisc group purchasing organization agreed to partner with WBAD to purchase generic drugs. See our May 2017 news roundup for details. Shares of Teva Pharmaceutical Industries Ltd., the world’s largest seller of generic drugs, fell 24% on Thursday in New York Trading after the company’s quarterly revenue and profit fell short of analysts’ forecasts, driven by a 6% decline in generic product prices from the same period last year. The Israeli company said the pricing pressure on generics won’t ease soon, and expects deflation to accelerate in the second half of the year. Teva’s stock dropped an additional 13% Friday. Pharmacies are experiencing deflation in their acquisition costs, too. Competition has forced wholesalers to pass along the generic savings earned from their negotiations. 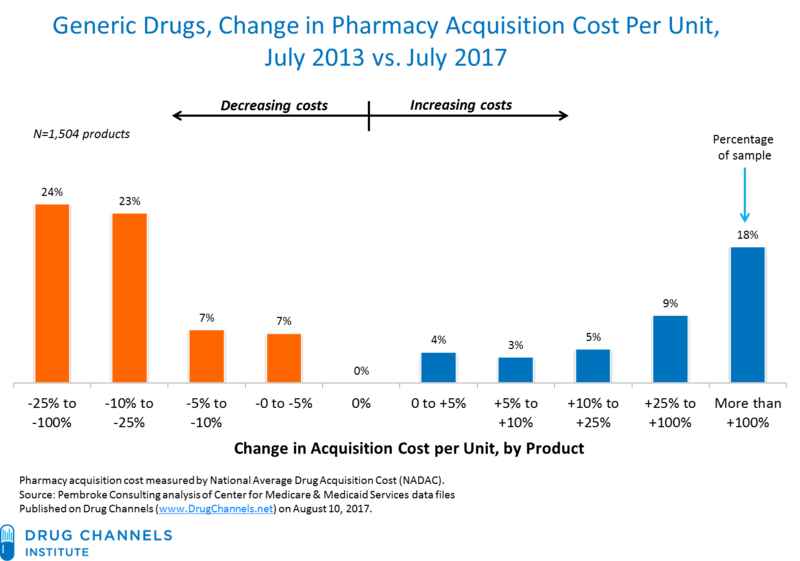 I discuss this dynamic in Cardinal Health’s Unhappy Profit Surprise: The Coevolution of Pharmacy Buying Groups and Wholesaler Economics. 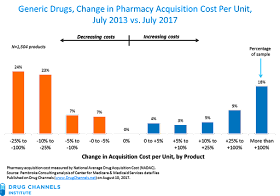 The chart below shows the frequency distribution of pharmacy acquisition cost changes from July 2013 to July 2017. More than 60% of the generic drugs in our sample declined in cost. About one-quarter of the sample experienced declines that exceeded 25%. Note that these figures reflect only the pharmacy’s invoiced cost and exclude off-invoice discounts, rebates, and other hidden price concessions provided to pharmacies. Actual (unreported) pharmacy acquisition costs for generic drugs may have dropped even further. Consider doxycycline hyclate (100 mg tab), a hyperinflationary generic drug that we highlighted in November 2013’s Retail Generic Drug Costs Go Up, Up, and Away. The reported pharmacy acquisition cost for this drug has dropped by 85%, from $4.18 per pill in July 2013 to $0.64 per pill in July 2017. If the FDA’s plans work, deflation should get worse before it gets better. Over time, I am mildly worried that this plan could backfire. Generic drug makers may exit unprofitable generic markets, which will lead to shortages of key products. A reduced return on investment contributed to rampant shortages of generic injectables. Let’s hope the market won’t overreact in the same way. Turn up your speakers and listen to the late great Freddie King sing about today’s generic drug market. Click here if you can’t see the video.